← Are Catholics Chicken or Something? The unfortunate victim of Constans’ wrath was the virtuous Martin. Born in Todi of noble birth, he had served as nuncio to Constantinople under Pope Theodore, gaining experience in dealing with the Byzantine court and familiarizing himself with the Monothelite teachings so prevalent in the East. Without waiting for the necessary imperial mandate, Martin proceeded with his consecration on July 5, 649. This independent act so enraged the emperor that he refused to acknowledge Martin as the legitimate pope. A staunch defender of the orthodox, Martin immediately convened a synod in the Lateran. Attended by 105 Western bishops, the synod studied all aspects of Monothelitism and the emperor’s Type. After nearly a month, the synod reached a conclusion. They determined that there were two wills in Christ, condemned the One Will heresy, and further condemned Constans’ Type for boldly prohibiting the truthful teachings of the apostles. 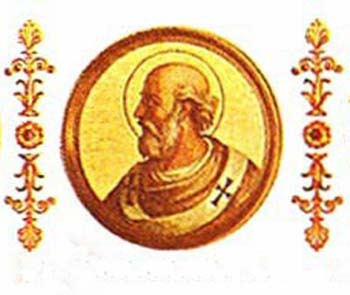 In an effort to pacify the emperor, Martin acknowledged Constans’ good intentions in trying to unify the Church and placed the burden of responsibility on the poor advice of Constantinople’s patriarchs. Read more here. This entry was posted in Saints and tagged Catholic Saints, Pope, St. Martin I. Bookmark the permalink.